Slightly larger than SFP+ devices, XFP transceivers support 10Gbps Ethernet, 10Gbps Fibre Channel, SDH (STM-48) and Sonet (OC-192) applications. High capacity CWDM and DWDM networks. Exact optical specifications may vary from those stated above which are representative for loss budgetary design purposes. If link optical parameters are marginal or critical then re-check these optical specifications at the time of purchase. Operating distances are nominal and actually depend on fibre link losses which are made up of the fibre length and attenuation, as well as the number and quality of fibre connections and fibre patches/splices. Please note that failure to observe the Rx Max and Min Attenuation parameters may cause transceiver damage. 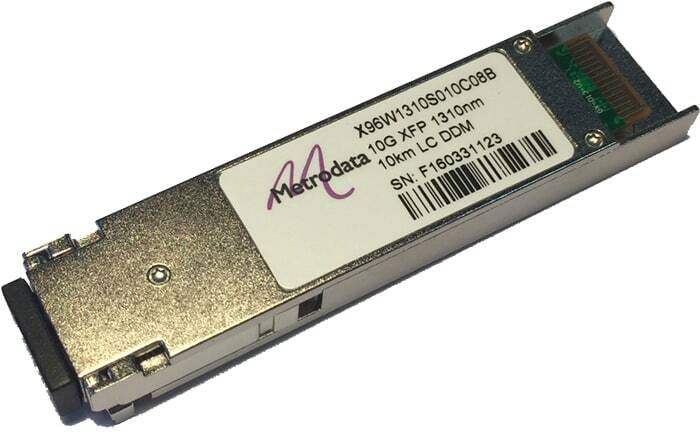 Many other XFP transceivers are also available with a wide range of different transmission/reception parameters.